Remember that bout a few weeks ago? Hello fans, friends, teammates, fellow derby girls and those who stumbled upon our site from searching “flat shoes women”(a true google search term someone used). Sorry for the delay in posting about our last bout but we can just say that our after party lasted three weeks? 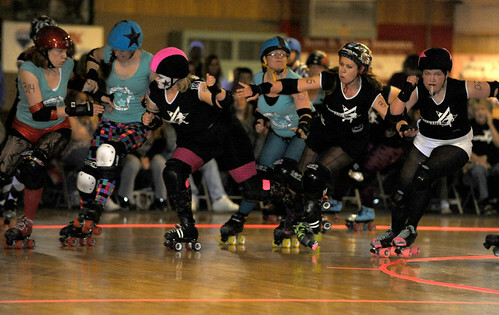 Come with me back in time to April 9th where we faced the Charlottesville Derby Dames in House of Pain. We love this marvelous team and loved the final score of 145-80 in Blackwater’s favour! We were lucky enough to have of our long time friend Groper Cleavage and his lady love Feel Her Up coaching our roster of 14 strong. This powerhouse derby pair ran a tight bench and our girls played hard. Thanks to the Dames for being such great competitors. As we were all parting ways at the end of the night after being filled up on $2 appetizers and the sounds of DJ Flow at Mangia, the Dames were already talking about when we face them again in September and threaten that it won’t be so pretty! So mark your calendars now, my friends, I predict many more good bouts with the ladies to follow. 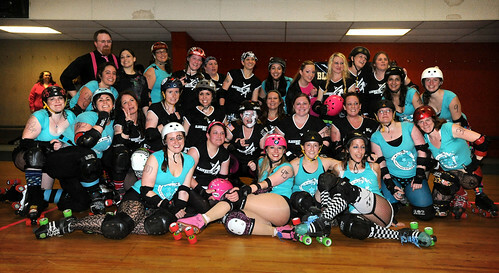 Thanks also to our refs, NSOs, fans, Richie Yates, AJ’s, Mangia, Appomattox Rescue Squad and all the derby fans! It was a great way to end our stint of home bouts. Up next we travel to Richmond for a co-ed bout against the Richmond Derby Demons. 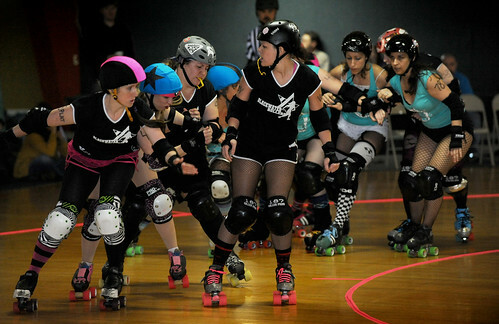 We are already focusing our practices on learning their rules and getting a sweet line up of derby dudes from all over. This will be something you don’t want to miss! 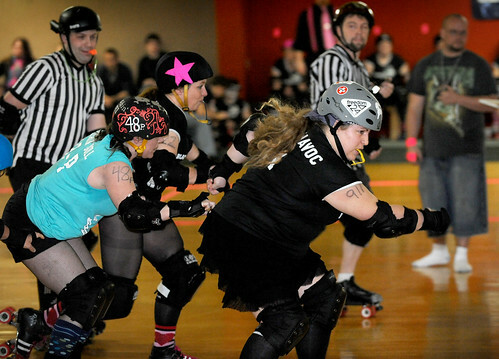 Here are some photo highlights from the bout. Check in tomorrow to read Fly Swatta’s interview with our MVPs!